Have you ever tried tempeh? Do you like it? (In case you don't know, tempeh is a fermented soy product that is a good protein source for vegetarians). I'll admit that I have a difficult time with tempeh. It can be bitter and I think the texture is a bit weird in dishes like stir fries. I definitely find it to be a challenging protein to cook well. In fact, this veggie burger recipe is the only one I have ever cooked that made me truly enjoy tempeh. This recipe takes advantage of the texture of tempeh, using it to help add some chewiness to the burgers. The burgers are flavored with chipotle peppers, cumin, garlic, chile powder, and cilantro. Salsa and avocado complement these flavors well and make great toppers for the patties. Unsurprisingly, these burgers don't have the flavor or texture of meat, but they really are delicious! If you are new to tempeh or experimenting with homemade veggie burgers, this is a great place to start. 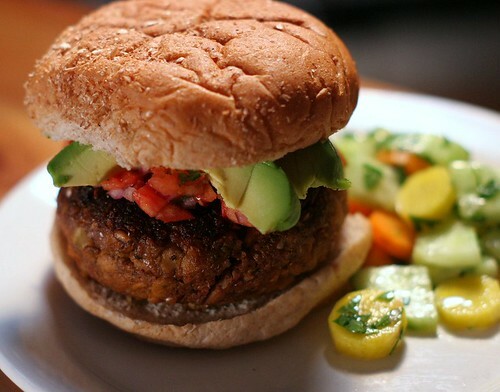 If you're interested in more veggie burger recipes, check out this post. Cover sun-dried tomatoes with boiling water and let sit for 10 minutes, then drain and set aside. Meanwhile, puree onion, garlic, and cilantro stems in a food processor. Heat 2 tbs of oil in a large heavy skillet over medium heat until hot but not smoking. Add onion puree and cook for 8 minutes, stirring occasionally. Add 2 tbs oil and tempeh and cook until tempeh is a pale golden color, about 4 minutes. Add cumin and chile powder and cook for 1 minute, stirring. Add 1 1/2 cups water, soy sauce, and bulgur and bring to a bare simmer. Cover and simmer, stirring occasionally, until liquid is absorbed, about 10-15 minutes (the time will depend on the coarseness of your bulgur). Remove lid and cook for an additional 4-5 minutes. Remove pan from heat and transfer half of the tempeh mixture to the food processor. Add sun-dried tomatoes, chipotles, mustard, salt, pepper, and half of the pumpkin seeds, and puree until mixture is smooth. Transfer puree to a large bowl, stir in the remaining tempeh mixture and pumpkin seeds, and chill in the refrigerator (uncovered) for one hour. Shape mixture into 8 patties, place on a baking sheet, cover with plastic wrap, and refrigerate for one more hour before cooking. Patties can be frozen on the baking sheet at this point - when they are frozen solid, remove them from the baking sheet and transfer to a freezer bag for storage. Burgers can be thawed by microwaving for about 1 minute before cooking. To cook - heat a splash of oil in a heavy skillet (use enough oil to evenly coat the bottom) over moderate heat until hot but not smoking. Add burgers and cook, turning once, until browned and warmed through, about 6-8 minutes total. Serve burgers on hamburger buns, topped with salsa or pico de gallo and avocado slices.